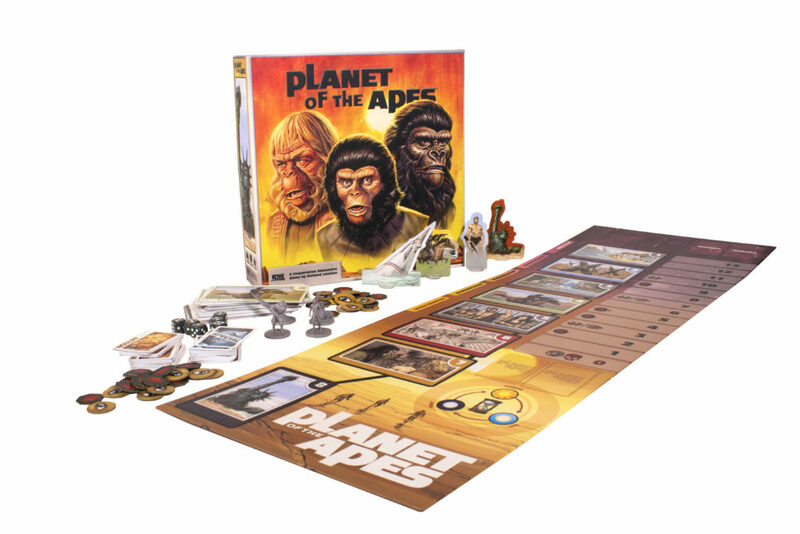 The Planet of the Apes board game by Richard Launius is available on game store shelves now and we were able to have him talk about his experience designing this co-op game for Planet of The Apes. What was the biggest hurdle in making the most iconic scenes into gameplay experiences? There were actually two major hurdles in turning the iconic movie of Planet of the Apes into a game that is both fun to play and true to the movie. The first is that there is only one key character in the game and that is Col. Taylor. To make the game provide the experience of the movie I felt the players all needed to be in Taylor’s place of discovering this new world in which Apes rule and mankind are the beasts and put them on a path of survival and discovery. Ultimately the idea dawned on me that the players could each be a different aspect of Taylor’s personality – all the same person, but as in the movie show the different sides of Taylor through the skills given to each personality. The second challenge was how to move the players through the story, creating the right level of stress along the way. 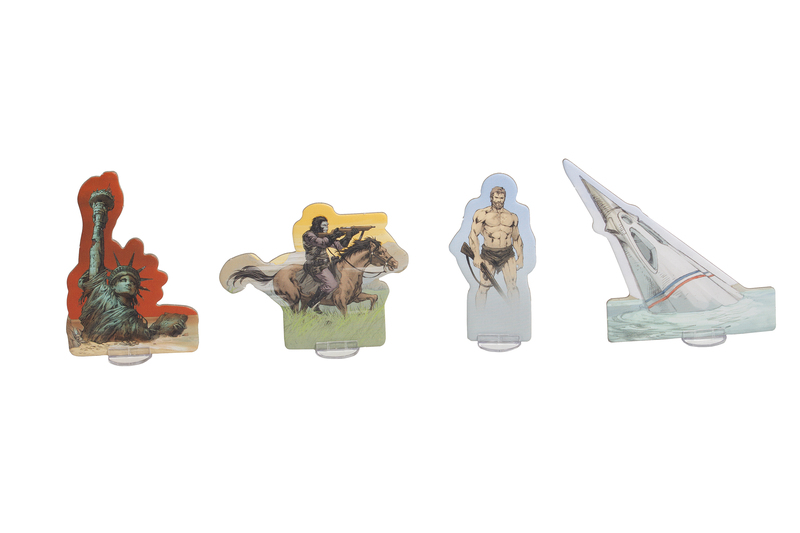 It took me four different designs before I finally came to the final version that is being published with the players moving from major scene to minor scene, each major scene a race with the Apes to the end with consequences for failing to complete the scene before the Ape token moved to the end. Additionally, the ever present Statue of Liberty token always moving toward the end putting pressure on the players to complete all scenes before it reaches the end gave the game the right balance level of excitement and pressure. Why go with a co-op game, compared to a versus game? 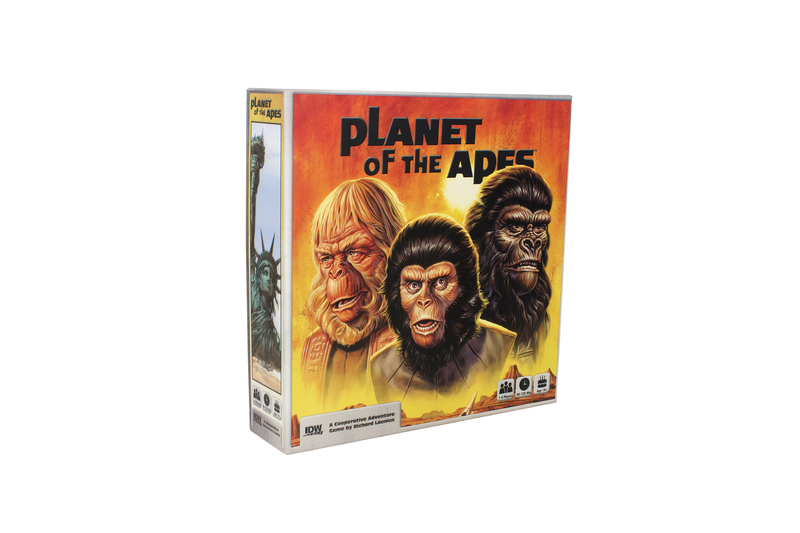 I think it is interesting that IDW contacted me because they felt the Planet of the Apes would be a great cooperative game and they knew I prefer to design co-ops, but in looking at the story I could not see this game as anything but cooperative. I am not saying that a Planet of the Apes game could not be one against many or even a two player game of Apes against Taylor, but the story just appears to be pure co-op from my perspective because we are all humans and I think should experience the story as humans striving to survive, searching for answers and a way back home, and driving toward the big reveal at the end of the game of what man’s war-like nature can do to civilization as we know it. The message is as true today as it was in 1968 and the best way to reveal that story is through the many personalities of Taylor as he strives to survive the Planet of the Apes. So, for me there was only vision for the game and it was as a co-op. How did you come to the 4 personalities of one person? I started by watching the movie a dozen times or so and trying to figure out what characters I could put into the game. Early on I thought that maybe I make it the 4 astronauts, keeping the female Stewart who died in flight when her cryonic tube cracked leaving her a frightening discovery when the crew was awaking, along with Landon, Dodge and Taylor but it just changed the storyline too much in my opinion. So, I continued to watch the movie and think on the problem of characters and it suddenly became clear that Taylor acted very differently at different times of the movie and it dawned on me that we all have different sides to us – we as humans have many levels to our personality. So, the next time I watched the movie I studied Taylor and saw the Cynical Taylor pontificate on the state of humanity in the universe, then Taylor as Commander of the Liberty 1 provide leadership in exiting the sinking ship and exploration of the planet, then the Defiant Taylor escape and tell the Apes, “Take your stinking paws off me you dirty ape!” and the Clever Taylor befriend Doctor Zira and debate Doctor Zaius. This discovery was a major break though in the design and it was easy to now see how their skill would work, how the players would need work together. What do you enjoy most about this game? First and foremost it is just fun to play. 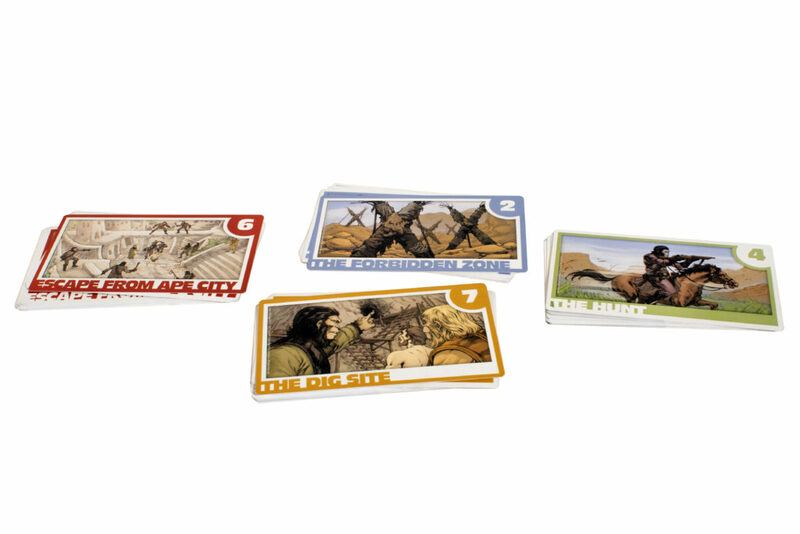 The players are involved in every player turn, using their skills to assist, passing cards, and pulling for the success of the active player as they feel the pressure of the Apes racing them to the end of the scene. For the players that love the movie, I feel it presents a true and respectful experience and based on the playtests I ran even folks that have never seen the movie enjoyed playing and wanted to watch the movie afterward. What are you hoping people will enjoy most during gameplay and what experience do you want them to takeaway? I want them to feel the pressure and discovery that Taylor felt in his discovery of Planet of the Apes and have fun in doing so. For me, all games should first and foremost be fun to play and I think there are a broad range of players that will enjoy this game, at least players that like cooperative games. I also hope it provides a respectful presentation of the movie and the story to the millions of fans of the original Planet of the Apes and that young people that have not watched this classic that has become so popular in new versions over the past few years that they want to watch the original an experience it I did in 1968 – a true classic from the very beginning. Richard Launius retired from AT&T in 2009 and began dedicating his time fully to designing games. Richard is primarily known for designing cooperative adventure games that are strong in theme. His design credits include: Arkham Horror 1st & 2nd Editions, Defenders of the Realm, Elder Sign, Dragon Rampage, Defenders of Last Stand, Ace Detective, Legends of the American Frontier, Run, Fight or Die, Pirates VS Dinosaurs, Draco Magi, Thunder Alley Crew Chiefs Expansion, Alien Uprising, and Cthulhu’s Vault, Madness at Midnight, and has done design work in Sentinels of the Multiverse and Bottom of the 9th. Richard has a number of games schedule to be published in 2017 – 2018 including; Fate of the Elder Gods by Greater Than Games, Saving Time by 8th Summit, Dragon Rampage 2nd Edition by Arcane Wonders, Shark Island by Upper Deck, Delve by Indie Boards & Cards, Planet of the Apes by IDW Games and the Thunder Alley Race Day Expansion by Nothing Now Games.